Famous for its clams, Ipswich also has several outstanding places to visit: the Crane Estate, Crane Beach, historic houses, nature reserves and Wolf Hollow. In Ipswich town proper there are bed-and-breakfast guesthouses, restaurants, and several historic houses. Right in the center of Ipswich (map), the stone Choate Bridge still arches the Ipswich River as it has since its construction "by Town & County" in 1764. On MA Route 133 on the south side of the bridge, toward Essex, is the Hall Haskell House holding the town's Visitors Center. Every New England seafood lover has heard of Little Neck clams. Most people think the name is a description of the clam, but in fact it eponym is from the Little Neck isthmus in Ipswich (near Great Neck) where the clams are dug. Hamlin Reservation (tel 978-356-4351), on Argilla Road (the road to the Crane Estate), is aproperty of The Trustees of Reservations. Its 135 acres (55 hectares) of fields, salt marsh and marsh meadow are open daily from sunrise to sunset for birdwatching, walking and nature study, for free. Other nature reserves in Ipswich include the beaches of the Sandy Point State Reservation in the Parker River National Wildlife Refuge at the southern tip of Plum Island; Ipswich Wildlife Sanctuary; and Willowdale State Forest, with 40 miles of hiking trails as well as fishing and boating opportunities. The Ipswich River Wildlife Sanctuary (tel 978-887-9264), 87 Perkins Row in neighboring Topsfield, is a 2800-acre (1133-hectare) nature reservation of the Massachusetts Audubon Society with 10 miles (16 km) of hiking trails, and opportunities for birdwatching and canoeing. There's an admission fee. 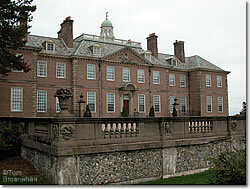 Crane Estate in Ipswich MA.